Arsenal have a rather lukewarm history where Brazilian players are concerned. Edu and Silvinho were good squad players that will also be remembered for passport issues. Denilson and Andre Santos won’t be remembered as success stories, whilst a fleet of young Brazilians, such as Wellington Silva (currently out on his fourth loan spell) and Pedro Botelho haven’t made the grade. Interestingly, Botelho is currently enjoying a fine season at Atletico Paranaense, who sit 3rd in Brasileirão having been promoted from Serie B last season. Fran Merida is also on their books, but playing much more fitfully. Going back further, Arsenal’s reserve left back Juan’s most notable achievement was to spawn the amusing chant “There’s only one Juan” in his solitary first team start against Gillingham in 2002. Gilberto Silva has been the only unqualified success having left his home state of Minas Gerais in 2002 to win a league title and two F.A. Cups at Arsenal. But there can be little debate about one of Arsenal’s least auspicious Brazilian signings. Julio Baptista joined on loan from Real Madrid in the summer of 2006, with a homesick Jose Antonio Reyes going in the opposite direction. Baptista arrived at Arsenal with some expectation and not solely because his talents had been acquired by Real Madrid. In the summer of 2005, Baptista, by now a powerful attacking midfielder with a boxer-like build and a penchant for late arrival in the penalty area, had been very publicly touted as Arsene’s preferred choice to replace Patrick Vieira. Baptista even came with a bestial nickname. ‘La Bestia.’ Or ‘The Beast.’ He was given this nickname whilst in Spain, which perhaps ought to have been portentous. Brazilians are hardly reluctant to assign animalistic nicknames to their players. Hulk being one such example, or Ganso, which is Portuguese for ‘Goose.’ Baptista earned commendation for his performances as ‘o volante’ (literally meaning ‘the steering wheel’, the common moniker given to defensive midfielders in Brazil) in a São Paulo side that featured Kaka and Luis Fabiano (the latter has since rejoined Tricolor). It wasn’t until he moved to Seville in 2003, that he picked up his infamous nickname. The loss of Vieira at Arsenal in the summer of 2005 meant a depletion of physical power in midfield and Baptista’s sobriquet and his build rather put one in mind of Blanco from Street Fighter. Baptista hit a purple patch of form for Sevilla, scoring a total of 47 goals across two seasons from 2003-05 as he was converted into an attacking midfielder. This piqued Wenger’s attention as he sought to find the impudent young Cesc Fabregas a “minder” in the engine room. The issue was that Real Madrid had also become interested in his exploits and fought us for his signature. The lure of Madrid proved too much and in the summer of 2005 he went to the Spanish capital instead, not least because a further year in Spain entitled him to dual citizenship. Used principally as an out and out centre forward, Baptista found it difficult to initiate the late runs into the penalty area that had brought him so much success at Sevilla. His ill-fated year in Madrid presumably stripped him of all his confidence as his technique was often verging on utterly appalling. Simple passes would be consigned to the opposition as ball after ball was carelessly lost under his stewardship. There were some positive signs. He opened his account in a Champions League game with Hamburg with a powerful header from an Emmanuel Eboue cross. It was an atypical goal for a Wenger team to score, which made us optimistic that Baptista at least presented a decent ‘Plan B’ even if he wasn’t the midfield general we’d mistaken him for. Hope that he might finally have arrived came in January 2007. Arsenal went to Anfield to play a rearranged League Cup tie having knocked their hosts out of the F.A. Cup on the same ground three days earlier. Baptista and Jeremie Aliadiere started upfront and tore a makeshift Liverpool defence limb from limb, winning 6-3. Baptista scored four and even missed a penalty. (A trick he repeated twice more in an Arsenal shirt). But the performance proved to be the exception rather than the rule. The Beast was by now openly mocked for having the world’s most misleading nickname. (“The Beast’s a f****g donkey!” was a favoured chant from a gentleman that sat behind me at the time). 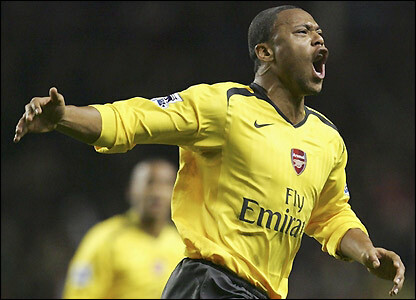 Baptista never established himself and his Arsenal career rather ambled under a series of listless performances. When Robert van Persie and Thierry Henry were injured simultaneously, Baptista’s nadir came when he still couldn’t make the starting line up for a game at Newcastle. Abou Diaby was preferred upfront with Emmanuel Adebayor. This followed a period where Arsenal tumbled out of all three cup competitions in the space of 11 days. He did manage to start the League Cup Final against Chelsea in Cardiff as the manager kept faith with the shadow side that took the Gunners to the Final. By now it was obvious that Arsenal were not in any rush to make Baptista’s loan permanent. In his final appearance for Arsenal he missed a penalty at Portsmouth, his third unsuccessful spot kick in our colours. Annoyingly, in a Roma shirt, he managed to smash his penalty confidently into the top corner when facing the Gunners in a Champions League shootout in 2009. Someone at the Gooner fanzine (I forget who) dubbed Baptista as “the kitten” as an antidote to his more terrifying nickname. Julio went back to Madrid and enjoyed a half decent 2007-08 campaign before joining Roma in Serie A. He subsequently joined Spanish side Malaga and has shown little trace of the abject incompetence of some of his Arsenal displays, even if he never quite managed to recapture the form of his Seville salad days. Malaga decided not to renew his contract in July and he joined Belo Horizonte side Cruzeiro. Brazilian clubs often conjure up imaginative ways to unveil new signings, the Cruzeiro board decided to reveal Baptista as ‘o raposa’ (their nickname, which means “The Fox”) shortly before a derby with their Belo Horizonte rivals Atletico Mineiro at Estádio Mineirão. ‘Galo’ had won Copa Libertadores in the stadium just four days earlier and keen not to be upstaged, Cruzeiro drove Baptista to the stadium unannounced, in an armoured tank, leaving him to sheepishly climb out of the vehicle amongst the supporters to grin for photos. The move has worked out well for Baptista, at the time of writing, his Cruzeiro side lead the Serie A table by 11 points and look guaranteed to win their first Campeanato Brasileirão title for a decade. This entry was posted in The Samba Series and tagged arseblog, arsenal, arsene wenger, brazil, gilberto silva, julio baptista, real madrid, Sevilla, tim stillman by The Samba Series. Bookmark the permalink.